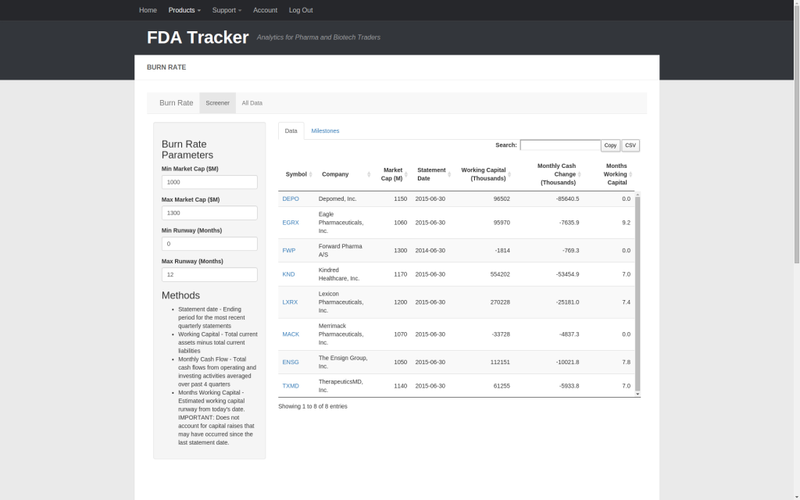 Burn Rate is a screening tool that estimates cash runways for biotech/pharma companies. It helps you predict when a company will raise money. The initial “Data” tab lets you screen companies by market cap and working capital runway. Working capital runway is estimated by dividing the working capital from the most recent quarterly statement by the monthly cash flow from operating and investing activities averaged over the past 4 quarters. It’s important to note that this is a rough estimate because it is susceptible to outlier events such as one-time charges. It also does not account for capital raises that may have occurred since the last statement date. Therefore, this tool should be used as a starting point in your research and all estimates should be independently verified. The table displays the stock symbol, company name, market cap, date of quarterly statement the calculations are based on, working capital, monthly cash change, and months of working capital for all companies matching the screening criteria. The months of working capital is current and reflects time from today’s date, not the statement date. 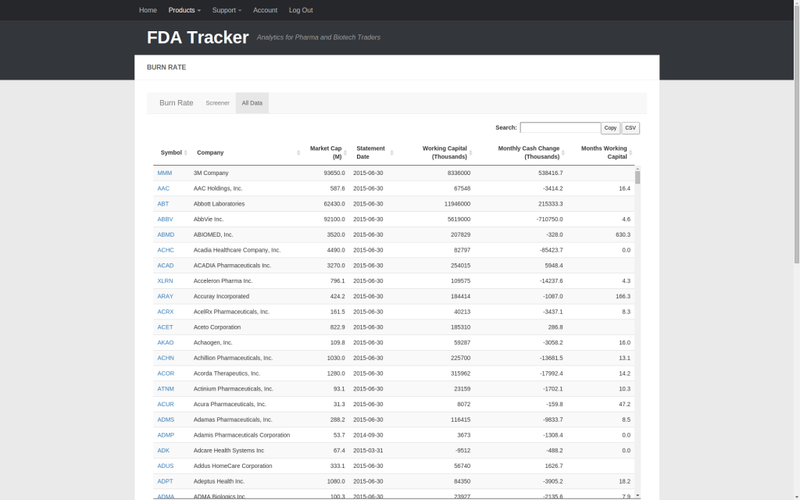 The “Milestones” tab gives greater context to the “cash zero” date by showing the relative timing of upcoming regulatory and clinical trial catalysts. 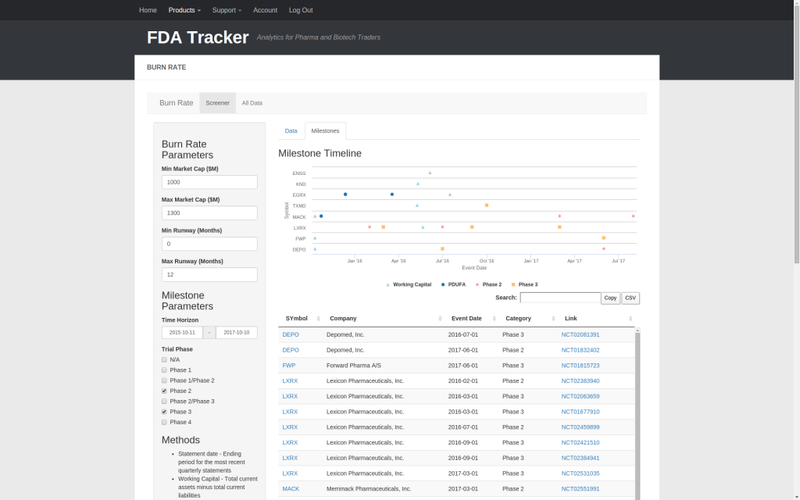 The timeline integrates data from Trial Tracker and the FDA Calendar to visualize all important catalyst dates. The table provides detailed information on all of the data points shown in the timeline. The “All Data” view provides a table of working capital runway estimates for all companies in the healthcare sector. Burn rate is a unique tool that combines data on financial, regulatory, and clinical trial catalysts into a single visualization. It will help you determine whether a company has enough cash to reach its next milestone.